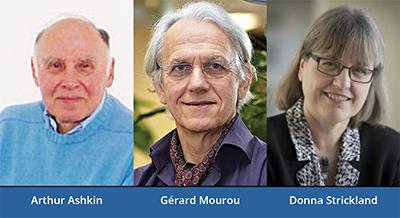 Arthur Ashkin, Gérard Mourou, and Donna Strickland have been awarded this year’s Nobel Prize in Physics for their groundbreaking work in the field of laser physics. Ashkin is recognized for his invention of optical tweezers, which has become a powerful tool for studying biological molecules and cells. Mourou and Strickland are honored for developing techniques to produce high-intensity, ultra-short optical pulses that have wide uses in engineering, chemistry, and medicine. Strickland is the third woman to be selected as a Nobel Laureate in Physics since the prize was first awarded in 1901. More in this APS News update. See also the Focus article, "Nobel Prize—Lasers as Tools."